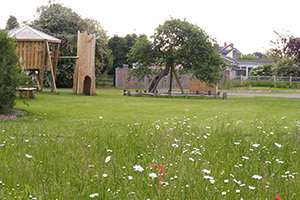 There has been a desire for a public Open Space in Tolpuddle for many years. The need for it was identified in the 1996 Village Appraisal. However, it was only with the construction of the bypass that there was an opportunity to create an Open Space in the village, which was previously divided by the main A35 trunk road. The land designated for the Open Space is historically important for the village. It is in the centre of the village and is recorded on the 1842 Tithe map as an orchard. In late 2007 Puddletown Area Parish Council agreed that a small group of volunteers could develop the land and the site was leased to the Council on a 999-year lease in the middle of 2008. Martin Cooke agreed to chair this group and in addition contributed a significant amount of volunteer consultancy time to managing the project. Led by Martin funding from a wide variety of sources was secured including from: Community Spaces, Viridor Credits, West Dorset District Council, Dorset County Council, Wessex Rivers and Salmon Trust and the Dorset Youth Capital Fund totalling over £100,000. The group were committed to providing a high quality Public Open Space. The park, named Orchard Meadow, opened to the public in early September 2009. Since then the site has been incredibly well used and is proving to be very well liked by visitors of all ages. Martin Cooke with the support of other Tolpuddle residents and their families has continued to manage Orchard Meadow on behalf of the Parish Council since opening in 2009.